Kasteel Wijlre estate offers several walking routes through its spectacular gardens. Every year, Kasteel Wijlre estate invites an artist, botanist, historian, architect or philosopher to develop a novel route through the garden. Each route tells its own story about the location. The visitor can discover the estate with the Butterfly Route, the Fragrance Route and the Greyometer. 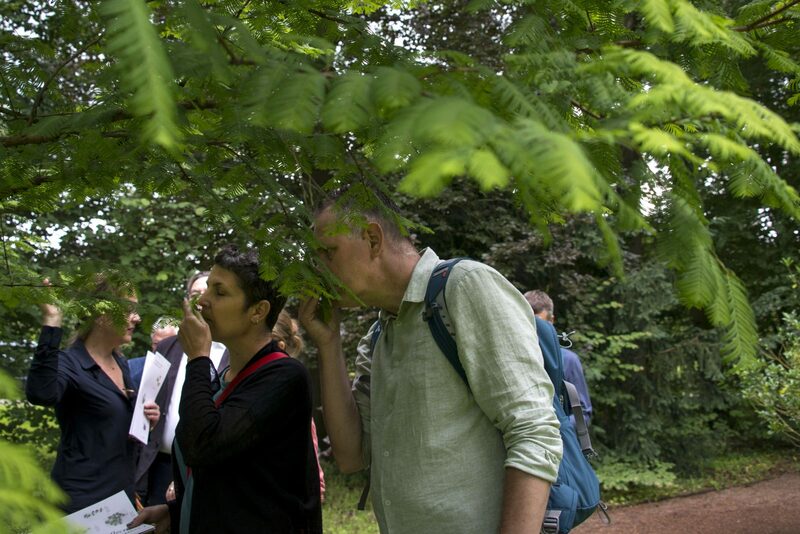 Botanist and artist Stefan Cools developed the Butterfly Route, which features places on the Kasteel Wijlre estate where native butterflies species develop from caterpillar to pupa and butterfly. The Butterfly Route is also appealing to children. Artist Sanne Vaassen in collaboration with fragrance architect Tanja Schell developed the Fragrance Route. Its route is inspired by the garden’s scents and Kasteel Wijlre’s residents and founders: Mr and Mrs Eijck. Artist Oscar Lourens developed the Greyometer. With the help of a circle with a grayscale, the wanderer measures the different shades of grey in the garden, the buildings and the art works at the estate.